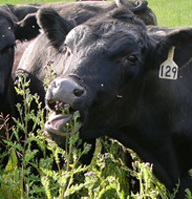 In 2004, Kathy Voth invented a method for teaching cows to eat weeds. Based on decades of science, her simple steps make it possible for anyone to save money and take advantage of new forage by turning their cows into weed managers. It's a free, weekly, online magazine for graziers translating research and experience into practices you can use right away. Head on over and get started reading! My six year research project explored the best ways to manage goats for fire control. The results are useful for land managers and those interested in running a prescribed grazing service.